Crafts, early science activities, activities for babies, circle time fun, games, and so much more! A picture game, word flashcards, activity sheets, a sudoku game, dress-up dolls and many other documents for indoor fun on cold winter days. 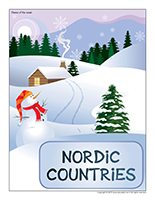 (Open thematic poster-Nordic countries) Print, laminate, and display all kinds of posters. 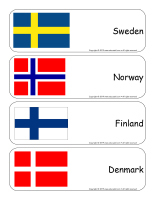 (Open educa-decorate-Nordic countries) Print, cut out, and laminate. Use the items to decorate the walls of your daycare and set the mood for the theme. 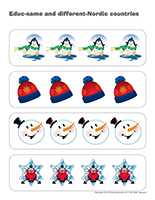 (Open garland-Nordic countries) Print and let children decorate the garland elements. 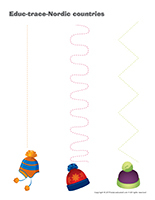 Cut out the items and use them to create a garland that can be hung near your daycare entrance or within your daycare. Set a large blue blanket or shower curtain on the floor to represent ice. 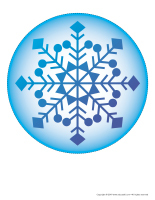 To represent icicles, recycle empty bags from cereal boxes or use waxed paper. Simply cut the paper into strips and twist them to give them a conical shape. Set white bed sheets or cotton batting on furniture items to represent snow. Children will love sitting on these soft textures. (Open craft-string of snow) Cut out the models. Set a model on a folded piece of paper and cut out the shape (leaving the edges connected so that when you unfold the paper, the shapes will be touching and form a string garland). Hang your string of snow in your daycare. (Open Poni discovers and presents-Nordic countries) Print, laminate, and cut out the cards. Present the different countries to your group using a Poni puppet or another puppet that children are familiar with. (Open picture game-Nordic countries) Use the pictures to decorate your daycare or to spark a conversation with your group. Print, laminate, and store the pictures in a Ziploc bag or in your thematic bin. (Open writing activities-C like cold) Print for each child or laminate for use with a dry-erase marker. (Open stationery-Nordic countries) Print. Use the stationery to communicate with parents, in your writing corner, or to identify your thematic bins. 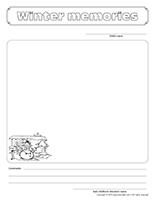 (Open activity sheets-Nordic countries) Print and follow instructions. 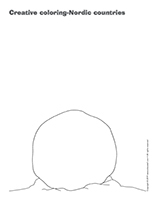 (Open activity sheets-Polar animals) Print and follow instructions. (Open educa-nuudles-Nordic countries) Print for each child. Have children color the sheet. Once they are done, they may use Magic Nuudles to turn the coloring pages into three- dimensional works of art. Variation: If you do not have Magic Nuudles, ask children to fill the spaces designed for Magic Nuudles with bingo markers or stickers. To order Magic Nuudles. (Open scene-Nordic countries) Print, laminate, and cut out. Children use the items to decorate the scene. (Open picture clue story-Snow) Print. Sit in a circle with your group. Begin reading the story. Every time you reach a picture clue, pause and give children time to guess the missing word that is illustrated. (Open sequential story-Polar animals) Print and cut out the pictures. Children must place them in the correct order. (Open sequential story-Ice) Print and cut out the pictures. Children must place them in the correct order. 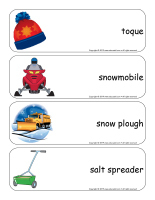 Print and laminate the theme’s word flashcards. Have each child pick a word (ex. snowmobile). Encourage them to tell you everything they know about each item. (Open perpetual calendar-Polar Day) Print and laminate. 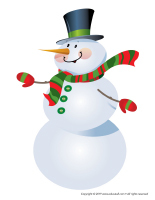 Greeting: Wear a toque, a scarf, and mittens to greet children in the morning. 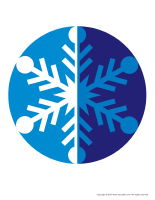 Circle time: Explore two different ice packs, one that is frozen and one that is warm. Pass them around your circle and encourage children to notice the difference between the two. Lunch and snacks: Ice cream, frozen yogurt, frozen banana chunks, frozen grapes, Popsicles, etc. At lunch time, serve cold soup and a salad or comfort food that warms the soul on a cold winter day (chicken noodle soup, vegetable soup, etc.). Special activities: Plan as many activities as possible outside. Follow tracks in the snow, build an igloo and a snowman, go snowshoeing, etc. Indoors, you can use sugar cubes and marshmallows to make unique sculptures, paint with white paint on dark paper, or explore a snow-filled bin with mittens. (Open Game-This is my spot-Nordic countries) Print two copies. Laminate and cut out the cards. Glue one copy of each card on the table using adhesive paper. Drop the other copies in a bag. Children take turns picking a card to determine their spot at the table for the day. You may also use the cards to determine naptime spots or for your task train. 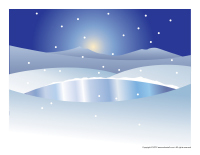 (Open my winter path) Print, laminate, and use adhesive paper to stick the illustrations on the floor, creating a path that leads to various areas frequently visited by the children in your group (bathroom, cloakroom, etc.). If you prefer, you can also use the illustrations to delimit workshops or corners within your daycare. Create an obstacle course and encourage children to imitate a polar animal as they complete it. 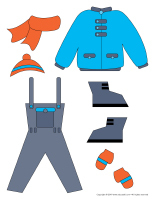 Set several pairs of mittens, boots, and wool socks in the centre of your daycare and invite children to associate matching items. Hang a winter-themed mobile over your changing table. Children will enjoy observing it during diaper changes. Freeze yogurt tubes. Let children manipulate them (before you open them). They will feel the cold on their hands. If you prefer, you can fill Ziploc bags with water and set them in the freezer. Fill clear plastic bottles with glitter and small winter-themed items. Use hot glue to seal the caps. Set them in the freezer and once they are nice and cold, let children manipulate them. 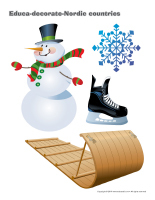 Encourage children to be active by inviting them to act out various activities that can be enjoyed during winter. Skating: They can simply pretend to glide across the floor. Cross-country skiing: They can move their arms and legs as if they are skiing. Snowball fight: They can throw imaginary snowballs. Watch out for the snowballs: You can throw imaginary snowballs. If you throw up high, children must curl up in a ball to avoid the snowballs whereas if you pretend to roll a snowball across the floor, they must jump over it. Downhill skiing: Children bend their knees and twist left and right (slalom). 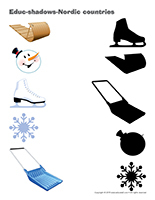 There are many ways to represent ice skates. Children can wear empty tissue boxes on their feet, wear wool socks, or simply step on felt soles. Glue snowman designs on empty soft drink bottles and line them up to create a simple bowling game. Children can roll a white ball (snowball) towards the bowling pins to make them fall. (Open lacing penguin) Print, laminate, and punch holes all the way around the shape. Children thread a shoelace, yarn, or ribbon through the holes. (Open models-fish) Print and have children colour the fish. Next, cut them out. Attach string to the end of an old broomstick. Hang a clothespin at the end. Hide behind furniture and attach fish to the clothespin. Children fish one at a time. You may replace fish with toys or small surprises. Variation: Write points on the fish (for example a small fish could be worth 2 points and a large fish could be worth 5 points). Set up fishing teams. At the end of the game, calculate each team’s score to determine the winning team. This game may be played outdoors. Simply laminate the fish and hide behind a snow bank. Bring your parachute outside. Shovel snow on top of it and with your group, have fun using the parachute to send the snow flying in the air. 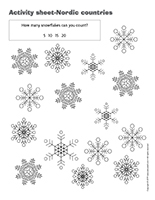 If you wish to do this activity indoors, use cotton balls to represent snow. Pick a child who will be the polar bear. The polar bear must hunt the others. Every time he touches a child, he or she becomes the polar bear for the next round. Variation: Instead, children who are touched by the polar bear can be asked to remain perfectly still, with their arms stretched out. The other children can free them by running under their arms. You will have to change polar bears often! Encourage children to walk like penguins, with their arms stuck to their body and their feet turned out. Have them observe their tracks in the snow. Invite them to make tracks that are close together and far apart. Prepare ice cubes of every colour with your group. Hide the ice cubes in the snow and have children search for them. If the group is old enough, you may ask children to find ice cubes of a specific color. For example, you may ask one child to search for blue ice cubes while another child searches for red ones. You may also ask the entire group to find only a specific colour of ice cubes. Choose an object with your group. Next, designate a child to hide the object in the snow and have the other children search for it. The child who finds the object gets to hide it next. Fill a few spray bottles with water and food coloring and let children use them to paint on snow. This unique paint will freeze and create blocks of colorful ice. For a washable version, simply add the felts of old markers to your water-filled spray bottles. Keep in mind that when markers are too dry for coloring, they can still be used for this activity! Use your sidewalk chalk to draw on frozen puddles (or hardened snow). The results will surprise you! Children mime the following actions: tiny snowflakes gently falling to the ground, snowflakes blowing around in the wind, snowflakes being rolled into a ball, falling in the snow, jumping in snow, building a snowman, melting snow, etc. This activity can also be done during transitions. Play music and encourage children to dance around the daycare. Every time the music stops, show children a picture of a polar animal and invite them to move like the corresponding animal. When the music starts again, children resume dancing and the next time the music stops, there is a new polar animal to imitate. (Open educ-same and different-Nordic countries) Print and laminate for durable, eco-friendly use. Children must circle the item that is different in each row. 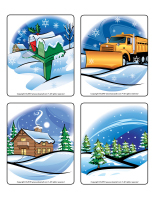 (Open bingo-Winter) Print, laminate, and store everything in a small box or Ziploc bag. Play bingo with your group. 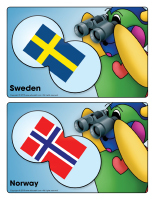 (Open color by number-Nordic countries) Print for each child. Children must color the picture according to the color code. (Open educ-trace-Nordic countries) Print for each child. Children must trace each line using a marker of the corresponding color before coloring the item at the end of each line. (Educ-shadows-Nordic countries) Print and laminate for durable, eco-friendly use. Children must draw a line between each item on the left and its shadow on the right. (Open Sudoku-Nordic countries) Print the grid and the cards. Cut out all the pieces and laminate them for durability. Children must place the cards on the grid while respecting traditional Sudoku rules: there mustn’t be 2 identical cards in the same row or column. 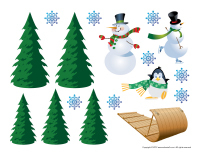 (Open association game-Polar animals) Print and laminate the pieces on the second page. Children use them to complete the missing parts on the first page. (Open dress-up dolls-Nordic countries) Print and laminate. Cut out the pieces and let children use them to dress the dolls as they wish. Pick a child who will be the penguin. With your group, sit in a circle around the penguin. The penguin walks around the circle, trying to make the others laugh. If he succeeds, the child that laughed becomes the penguin. Use three pipe cleaners and twist them together to form a ball or a cube. Dip them in water and hang them outside. Observe the formation of ice crystals with your group. Fill a variety of plastic containers with water. Hide tiny items in each one (figurines, toy cards, blocks, etc.) and set them in the freezer or outside. Remove the ice blocks from the containers and invite children to guess what is hiding in each one. Observe the ice as it melts away. Children will enjoy discovering the surprises. Drape white blankets over a table to represent an igloo. 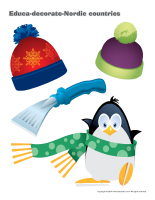 Set a bin filled with snow and winter-themed figurines in your igloo and let children play. Wet several towels and facecloths and hang them outside for a few hours on a cold day. They will harden. Show children how they can bend them to create unique sculptures. Prepare several ice cubes with your group. They will love watching the water turn to ice. The next day, use the ice cubes to represent an igloo. Set a large block of ice in a bin and invite children to play on it with figurines. Help them notice how quickly the ice melts. Provide a bin filled with flour, sugar, salt, rice, or snow. Let children play in it with figurines or polar animals to provide them with the opportunity to discover a new texture. Invite children to paint with dark paint and then with a lighter paint color. Use this activity to explain how an arctic fox’s fur changes color during winter, from a grayish-brown to white. A walrus’s nose is quite prickly. Show children a picture of a walrus. Provide modeling dough and ask them to insert toothpicks or drinking straws in the dough to make it look (and feel) like a walrus’ nose. With your group, melt marshmallows in a bowl in the microwave for approximately 30 seconds. Give each child the chance to stir. Return the bowl to the microwave for 10 seconds more. Set the bowl in the centre of the table. Provide more marshmallows. Children can use the melted marshmallows like glue to stick non-melted marshmallows together to build an igloo. Show children how they can make their own slushies using crushed ice and fruit juice. Let them stir their slushies with spoons. (Open puppets-Nordic countries) Print the models on heavy paper. Ask children to cut them out and decorate them with various arts & crafts materials. Glue a Popsicle stick behind the models to complete your puppets. You will need a large piece of cardboard. Ask children to completely cover it with white paint. Throughout the week, they can create an arctic world. Provide a wide range of white material and accessories. Add penguins, polar bears, fish, seals, etc. A few suggestions: marshmallows, sugar, salt, flour, salt dough, white modeling dough, white glue, cotton balls, tissues, egg shells, empty egg carton sections, etc. (Open stencils-Nordic countries) Print and cut out the various stencils. Children can use them to trace or paint items related to the theme. You can stick the stencils on a large white paper banner and encourage children to splash paint on them using a toothbrush. You will need three Popsicle sticks per child. To begin, have children paint or color them. When they are dry, dip either end of each Popsicle stick in white glue and then in colorful glitter. Let dry. 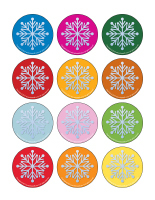 Assemble the Popsicle sticks to represent a snowflake shape. Hang the snowflakes from the ceiling. Give each child a small plastic bottle (Yop). Have them glue black and white feathers all over their bottle (or scraps of paper). Add wiggly eyes and a small orange construction paper triangle to represent a beak. For each child, cut a piece of cardboard to represent an igloo outline. Let children glue miniature marshmallows all over it. 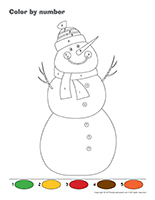 If you prefer, children can create snowmen using the same technique. Let dry and display their artwork in your cloakroom. (Open mini penguin) Print, cut out, and color the pieces. Have children glue them on an empty toilet paper roll. Hang the miniature penguins from the ceiling. Variation: If you wish, you may also use empty drinkable yogurt bottles (Yop). (Open mandalas-Penguins) Print for each child. Invite children to color the mandalas to help them calm down. (Open models-Penguins) Print and decorate the penguins with glitter, cotton balls, confetti, etc. Glue two penguins back to back on either side of a ribbon and hang them from the ceiling. Give each child an aluminum pie plate. Have them deposit glitter, metallic confetti, and tiny seasonal objects in their plate. Fill the plates with water and add a long piece of ribbon, letting it hang over the side. Set the plates outside on a cold day. Once the water is frozen, gently remove the paper plates and hang your icy suncatchers in a tree in your yard. (Open craft-polar bears) Children glue cotton balls all over to fill their polar bear outline. Have children draw a polar animal on a white piece of paper using a white crayon. When they are done, encourage them to present their animal to the group. Note: Using a white crayon on white paper fosters children’s imagination and creativity. Glue cotton balls and white feathers on a piece of paper to represent a snowy owl. Add wiggly eyes. If you, wish you can draw an owl outline to make this activity easier. 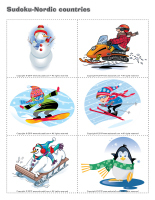 (Open creative coloring-Nordic countries) Print for each child and encourage them to complete the picture. 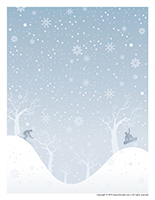 (Open scrapbook-winter memories) Print this new page for each child. Add it to each child’s scrapbook. If you do not have a scrapbook for a child, visit the scrapbook section of the educatall club. 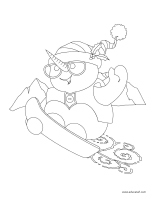 (Open coloring pages theme-Nordic countries) Print for each child.